What’s your firm worth, without you? Over the last few years there have been numerous practice management articles on the subject of succession planning. And, as you may know, few advisers have done much about it. In sessions that I’ve conducted, I’ve asked advisers ‘How many of you have a succession plan?’ Typically, fewer than half of the advisers in the room will raise their hands. Even more telling, when I’ve asked those who actually have a written plan to keep their hands raised, most of the hands go down. And, when asked to keep their hands up if their written succession plan includes a funding mechanism in place to actually complete the sale or transfer of the business, usually there are no hands left. The first two answers are really just excuses. Succession should always be an objective for a business owner no matter how busy you are or how far into the future it will be before you retire. We don’t let our clients wait until the last few years before retirement to start planning, so why should we? 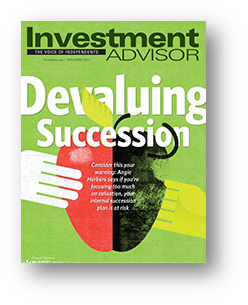 In an article in Investment Advisor Magazine’s January 2014 issue titled “Untangling Ownership”, Charles Farrell and Fred Taylor of Northstar Investment Advisors of Denver, CO understand the real issues. “In order to build any kind of enterprise value, to be worthy of receiving some sort of buyout when you retire, you have to build a business not a practice”, says Farrell, CEO for Northstar. And this is the issue. Most independent advisers, build a practice that is unique to them. They market themselves and their own money management philosophy. Advisers desire to show clients that they are unique in order to attract new business. But this ‘uniqueness’ can backfire on you because when you leave, your business is no longer about you. So, what’s left for your clients after you told them that you are the pied piper? Farrell goes on to tell us that “Saying you have a practice that’s unique to you, the clients are tied to you, the philosophy’s tied to you; there’s really no way for anyone to buy you out because there’s no way to tell how many of those clients will stay, what sort of revenue you’ll generate, not a year or two out, but really 10 years out”. Why would another adviser want your mice? They must be retrained to follow him. How long will that take? What will it cost him? And, how much effort will be needed? How do you avoid some of the challenges to succession planning? Unfortunately, it may not be possible for some advisers. Charles Farrell mentions that many advisers who start their own firms are Type A personalities. “They don’t like to listen to other people. They don’t play well in groups.” Many independent advisers leave wire houses or larger practices because they want to strike out on their own. They want to avoid ‘managing people’ and dealing with all of the issues (i.e., hassles) that go along with working (or managing, or owning) a large firm. But, it’s the avoidance of dealing with those very issues that will also prevent you from turning your practice into an ongoing business that will have value after you leave. If you want your business to have value, you need to build value throughout the life of your business by recruiting associates who will eventually become partners. You’ll need a program to transfer ownership to those partners to provide incentive for them to remain with the firm (‘their’ firm). You’ll also need to change your thinking when it comes to making the business all about you, Mr. Type A, by creating an offering (including processes, communications, etc.) that will make clients loyal to the firm – rather than just you. This is no easy task, and cannot be accomplished in the few years before you’re ready to retire. Just like we tell our clients, the sooner you begin, the more likely you’ll be to accomplish your objectives. I reccomend that you read this excellent article at thinkadvisor.com for more insights from a group of advisers who have been successful in creating a business that will be able to transfer value to its advisers when they are ready to depart, while retaining value for their clients who stay on. So, what’s your firm worth, without you? Well, that’s really up to you — but not just you. As we get closer to Christmas, we’re naturally thinking about what we’re going to give the people who are on our Christmas list. We typically go through a process that attempts to help us by asking ourselves “What would my brother like for Christmas?” or “What would my 12-year old nephew want?” To accomplish this (and to come up with the perfect gift), we practice ‘empathy’. Merriam Webster defines empathy as ‘the action of understanding, being aware of, being sensitive to, and vicariously experiencing the feelings, thoughts, and experience of another of either the past or present without having the feelings, thoughts, and experience fully communicated in an objectively explicit manner’. In other words, when we ask those questions, we try to place ourselves in the mindset of the person who will be receiving our gift. By doing so, we hope to give them something that they will value, appreciate, or enjoy. Empathy is an important concept when it comes to your business. As you think about your goals and objectives for the new year, now may be the perfect time to practice empathy with regards to your clients, and prospects. The idea is to project yourself into your clients’ experience with you, your firm, and staff in order to gain a deeper level of understanding of your client — by placing yourself ‘in their shoes’. 1. What does my client see? His environment. What does it look like? Who is around him? Who are his friends? What types of offers is he exposed to? 2. What does my client say and do? Imagine what he could be telling others. What is his attitude? Are there conflicts between what he says and what he does? 3. What does my client hear? What does his spouse say? His friends? Who really influences him? Which media channels are influential? 4. What does my client think and feel? What goes on in his mind? What is really important to him? What are his emotions? What moves him? What keeps him up at night? What are his dreams and aspirations? 5. What is my client’s pain? Biggest frustrations. What obstacles stand between him and what he wants to achieve? What risks might he fear taking? 6. What does my client gain? What does he truly want to achieve? How does he measure success? What are strategies that he might use to achieve his objectives? 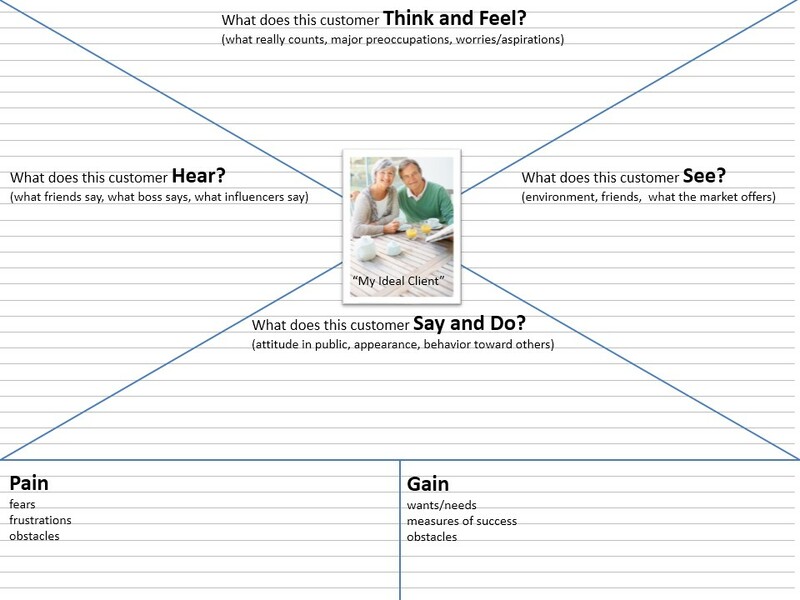 The goal of producing an Empathy Map is to create a customer viewpoint for continuously questioning your business model assumptions. Understanding your customers’ needs and desires will enable you to better determine if you have the right Value Proposition for your business. It will help you determine if your customer will be willing to pay you for this value. And, it may help you determine how to better reach new customers who have the needs and mindset that match your Value Proposition. The point is to truly understand and empathize with their situation so you can design and provide a better product or service — as well as create deeper relationships with your clients. So, what does your client want for Christmas? The same thing we’re all are interested in — your empathy. It’s that time of year. Time to think about and give thanks for all that we have. What do financial advisers have to be thankful for? So many things. Here are just a few. Firstly, the upfront costs or investment needed to build an advisory business provides those who possess an entrepreneurial spirit with the opportunity to build a business with much less capital than most other types of small businesses. Even many franchises require tens of thousands of dollars to get up and running. Advisers have many different ways to structure their businesses, and also determine what products and services they will offer to their clients. You can even decide what type of clients you want to service by building your business around a niche market (it’s actually quite a wise move). You can choose from a wide variety of vendors that can become strategic partners – allowing you to gain scale in your business by outsourcing important functions and processes that could be accomplished more cost effectively and efficiently by someone who specializes in performing that service. There are money managers, marketing specialists, practice management consultants, social media experts, IT consultants, web design firms, and on and on. In fact, if there’s something that you need, but don’t want to do yourself, you can likely find someone who will do it for you. Technology is also enhancing and providing new (and often better) ways to communicate. Advisers can place Skype calls to meet with clients ‘face-to-face’ without being in the same room, or even in the same city – allowing you to expand your business beyond the local geography. Online webinars can provide opportunities to update your skills and knowledge, and Google Hangouts can offer a chance to collaborate with associates. Advisers are also increasing the use of video to tell their story. More and more adviser web sites are using videos to introduce the adviser in a friendly and nonthreatening way. Some videos are more formal — filmed professionally. Others are using a ‘down-home’ informal and friendly approach that can be very engaging and will resonate better with certain types of clients. Advisers (much like their clients) are more mobile than ever. It’s no longer necessary to sit down at your desk to access your client accounts. Broker-dealers and custodians have recognized the need to provide their advisers with easy access to client information on smart phones and tablets. And we should certainly give thanks that our regulators and compliance departments have gained some comfort around the use of social media, and lessened our reluctance to use it to build a market presence. More advisers are beginning to see the benefits of using Facebook, Twitter, LinkedIn, Pinterest, and other platforms to build their brand, create conversations, and gain new clients. By the way, it also doesn’t hurt that we’ve had a stock market (DJIA) that has been generally rising over the past year, as well as the last 5 years, and recently topped 16,000. Yes, there are many more reasons that we should give thanks, but let’s not forget the most important reason — our clients. Our profession gives us the opportunity to meet so many people. People who need our help. They come in all shapes and sizes. Some successful. Others struggling. Most care about themselves and their families. Some want to provide charitable help to others. They’re concerned about lessening the impact of taxes on their income, investments, and estates. They worry about outliving their money, and whether Social Security will be around for them when they retire. They want to know how to prevent losing the large amount of money that they’ve accumulated in their 401(k) over the many years that they’ve worked, and they’re scared as hell that they will lose something even more valuable after they retire — their sense of self-worth and purpose when they are no longer a nurse, or a baker, or a Vice President. This is the ‘WHY’ behind what we do. It’s why we battle with the regulators. It’s why we suffer through the negative media stories. It’s why we endure the countless interviews to find the right people to staff our practices. It’s why we come in early. It’s what keeps us up late. It’s because we care. We care about helping people to reach their goals, to fulfill their dreams. It isn’t easy, but when we are successful, there is no greater reward. And for that alone, we should give thanks. We’ve seen the news reports, the interviews, the photos. But it’s still hard to comprehend the devastation that took place from Typhoon Haiyan. Few of us will ever experience this type of disaster on the scale that occurred there. We feel for the people. Our hearts are heavy. We send our prayers and make donations of money, food, water, and other essentials to try to help the people of the Philippines. It will take a long time for life there to return to normal – if it ever can. And although it’s the people that are most important, as a business consultant, I can’t help but think about the thousands upon thousands of small businesses that have had their operations disrupted by the storm — because a disruption of a business hurts many people. Employees may not be paid, or may even lose their jobs. Vendors and suppliers may lose their customer. Clients of the business may no longer receive the goods and services that were important to them. And, of course, everything that the business owner may have been building for themselves and their families could potentially be lost — maybe forever. I’ve spoken to many advisers who have experienced disasters – from fires and floods to Katrina and Sandy. Some have disaster recovery plans, and have shared how their plan was helpful to the continuing operation and eventual recovery of their business, but many advisers were either poorly prepared or unprepared. How about your business? As a practice management consultant, I’ve hosted sessions for advisers on disaster recovery, and thought it timely to share a few ideas here. There is so much that can be done to lessen the effects of a disaster on your business. There isn’t room here to discuss everything, but here are some ideas to get you thinking, and hopefully motivated, to create your own plan. Don’t try to do it all by yourself. There are plenty of resources available online to get you started. Do a Google search for ‘disaster recovery’. In the top of the results you’ll find a great site by FEMA, the Federal Emergency Management Agency. They know a thing or two about disasters. There are also lots of sites that offer help to small businesses. Network with other advisers. Talk to other small business owners in your area. Brainstorm with your employees. Contact your broker/dealer and your vendors (fund companies, software vendors, etc.) to ask how best to work with them in case of a disaster – that could occur on your end, or theirs. Your employee, client and vendor contact information should be readily available (i.e., a copy should be stored offsite) in case you can’t get to your (or no longer have an) office. (Before storing client information offsite, talk with your broker/dealer and compliance department so that you follow privacy regulations and any internal rules regarding client information.) Do you have multiple ways to contact your employees — through different communications channels? Do you have their personal email addresses, cell phone numbers, even their social networks? Do you know their family members or close friends, and could you contact your employees through them if necessary? What about your vendors and suppliers? And, of course, your clients? By the way, expect employee absences. A disaster may have an effect on your employees. If key personnel can’t get to the office because they are dealing with the impact of the disaster on their own property or families, you must have redundancy in your operations. How will responsibilities be delegated to various staff members during a disaster? Cross training employees can allow your business to continue operating smoothly when an employee is sick or on vacation, but it becomes even more important during times of disaster. I find that few advisers have a written operations manual or appreciate its importance, but having a written manual will help you and your remaining staff to continue to service clients when staff members who normally perform certain tasks aren’t available. How do you get into the software to initiate a distribution for a client when only Jane has the password — because she’s the one who usually does the distributions? It may have taken you years to build the infrastructure of your practice, so inventory your systems and have schematics of your infrastructure. How will you recreate your business, if it becomes necessary? Do you have the ‘blueprints’ to put your business back together? How would you go about it? What would you need? How would you access it? Where would you start? What would it cost? One of the most effective suggestions that I can make to help you recover more quickly from a disaster is to choose an ‘owner’ to direct the recovery. If you are fortunate to have an employee who has strong organizational skills, who is a leader, and is very responsible, then make that person the owner of your recovery. Having someone in your firm that you can rely upon to take charge of the administrative aspects and details of the recovery can free you to work on big picture strategic initiatives, and give you more time to talk with your clients. Throughout your discussions, don’t forget the most important component of your disaster recovery process – your clients. It’s very important to clearly communicate what’s taken place and keep your clients informed of your progress. An effective recovery plan should allow you to operate in a ‘business as usual’ mode, but, if it’s necessary to make changes in your operations in order to accommodate the conditions, do your best to limit inconveniences to your clients. Most clients will understand that it may take longer to process requests after a disaster has occurred, but will likely want to know that their assets and investments are ‘safe’. And, they may want to be reassured that any private information is also secure. Having a well-constructed, written disaster recovery plan that has been thoroughly prepared and effectively communicated to everyone who may be involved in the recovery of your business may help you to continue to operate during a challenging time, and get ‘back to business’ much sooner. “The financial planning experience is a combination of a dental exam, math class, and marriage therapy” according to Dr. David Lazenby, speaking at a recent FPA Retreat conference. No wonder advisers have difficulty attracting new clients and getting referrals. What couple wants to go through that kind of experience – annually? And, why would you recommend it to your friends or family? There is no doubt that we could must improve not only the delivery of our services, but more importantly the perception of value and the client experience. These days we are no longer competing solely with other financial advisers or advisory firms, but with companies like Amazon, Zappos, Nordstrom, and Apple. Companies who have learned how to provide their customers with memorable (even ‘remark-able’) client experiences whenever an interaction takes place. Companies who our clients love and wish we could emulate with the experiences that we provide. I just finished reading Michael Kitces’ article titled ‘What if Financial Planning Was More Like Build-A-Bear?’ in the November 2013 edition of Investment Advisor magazine (you should also be following his Nerd’s Eye View blog). If you have children, and have a Build-A-Bear store in a mall near you, the experience is probably familiar (my daughter had her 9th birthday party at one with her friends). As Michael describes in his article, the company takes ‘a product long since commoditized’ (teddy bears) and turns the process from ‘a few minutes at a cash register or website into a multi-hour interactive experience’ for you and your child. The child has a ‘much deeper buy-in’ because he or she is building a ‘new friend’, and Mom and Dad end up spending twice as much money to get the ‘same commoditized product’ (Yes, this is true, Michael). Wait a minute. Did you get that? Let me say those two phrases again – ‘much deeper buy-in’ from the client and ‘willing to pay twice as much’. What adviser doesn’t want clients who are fully ‘bought-in’ to him and his firm, and willing to pay more for the client experience he provides — if indeed there is superior value? So, what could we do to enhance the client experience? The Investment Advisor article suggests that changing the experience to be more interactive for the clients will create stronger relationships which will lead to more referrals. People need help with basics like organization, so we could assist them by sorting through their statements and prospectuses to help them decide what to keep and what to discard (although I’ve seen few advisers who are willing to do this), but we could go even further. I’ve always told advisers that there is a big difference between data and information. That difference is primarily one of perspective – who’s looking at it. Data is raw. It may be organized, but it’s still just data. Until it is converted into relevant and useful information for the user (by placing into the proper context), it offers little value. As an example, advisers will often simply take a report from a money manager or fund company and pass it along to their client. In most cases the report was written for the adviser (not for the client) and has very little value to the client. The fund company may have taken data and converted it to useful information for THEIR client (i.e., the adviser), but now the adviser must take what is data (from his client’s perspective) and turn it into useful information for HIS client. This is where value is derived. I also love Michael’s suggestion to use mind maps to illustrate a client’s situation. I’ve frequently used mind mapping and electronic tools like Mindjet’s Mind Manager software to map out difficult concepts that I’m trying to understand. John Bowen of CEG Worldwide (and his co-authors Patricia Abram and Jonathan Powell) do a nice job of showing how mind mapping could be used to create a ’Total Client Profile’ in his book ‘Breaking Through – Building a World-Class Wealth Management Business’ (page 53). Imagine if the map could be interactive – allowing the adviser and his client to navigate through it during their planning meeting — and make changes, and see the consequences, as they review it. Michael says ‘People will pay a lot more to an experience-based business that charges them for the feelings they get from engaging than they will to a business that sells stuff or charges for services rendered.’ I agree. Please read the valuable insights he offers in his Investment Advisor article, and look for ways that you can improve the client experience for your clients today. Ask your financial planning software provider to incorporate more interactive tools and features into their software. Watch for new tools coming from companies outside of our industry and consider how they could be used to improve the client experience. It matters. In my time as a practice management consultant, I’ve talked with many financial advisers about various issues and challenges to their businesses, but this was certainly the most unusual call that I’d ever received. My initial reaction was that it was a prank. I was being ‘punked’. “OK. Very funny. Which wholesaler put you up to this?” I said to the adviser. “What? No, I’m serious” he said. “Well, I spent many years as an airline pilot for one of the big airlines. Flew all over the world, and really enjoyed my job, but I was always interested in the financial markets, investing, and the economy. I managed my own money, and did pretty well. I decided that when I retired from flying for a living that I was going to be a financial adviser, and that’s what I did. I became a CFP and an RIA and have my own firm now. And, I’ve become known as the ‘financial adviser for airline pilots”. I have to admit that I tell this story almost weekly. It’s usually because I’m trying to help an adviser to see the value of choosing and building business in a specific niche market. (I work to connect advisers with Federal employees.) But finding the right niche isn’t the biggest challenge for most advisers. It’s convincing them in the value of having a niche in the first place. Most advisers are afraid to choose a niche because they are worried that they will be limiting the amount of business that they could do. Me: “OK. So, you were listening (at least he caught the part about the pilots), but you need to understand the lesson in my story. Find a group that you have an affinity with. An adviser may find a ‘natural’ niche based upon an affinity with a particular group. For example, a former teacher will likely find it easier to relate to and work with teachers. An adviser who worked for a large employer in his city may find his niche in working with employees of his former company. People feel comfortable working with someone when they have something in common – like the pilot and his pals. A natural niche may be based on geography, common philosophies, race, religion, or a job. Niches are well-defined groups of people with something in common. Products (e.g., annuities or mutual funds) are not a niche. Women are not a niche (too broad a category). And stop telling me that your niche is ‘people with money’. That’s not a niche either. An adviser who has difficulty finding a natural niche can still develop one by gaining a body of knowledge that may be unique or specialized. In other words, if you learn more about your subject than anyone else (by becoming an expert), people in need of your expertise will flock to you for your help. An example of this in the financial services industry is Ed Slott. Simply Google his name and you’ll find his website – irahelp.com. His name has become synonymous with IRAs, and he has built a large (and certainly profitable) business on being the best person to contact on Individual Retirement Account questions – whether you’re an adviser needing training, or a consumer watching one of his television shows on a PBS station. But what about the financial adviser to airline pilots? Well, we had a good conversation about direction and strategy. He just needed help with setting the coordinates on his compass for his next destination. You see most advisers believe that the sky is the limit, but it’s pretty big and mostly empty up there. Unless, like the former pilot, you’ve managed to find the ‘right’ piece of the sky — your sky. I like real life case studies. Let me share one with you. When I talk with financial advisers about the opportunities to help Federal employees, I often recommend that hosting an employee benefits program similar to this one offers an ideal occasion to meet people who need their help. The association in this particular area only hosts these programs every two years. During that time there is a large vacuum of questions that builds and is looking for escape. We were able to help release that vacuum with the information that we provided. The comments we received on our evaluation form from the attendees were very favorable, but many would have preferred more time to ask questions about their individual benefits and circumstances. Those who had additional questions added their contact information to the evaluation form, and about one third of them want to meet with the adviser in the coming weeks (and possibly many more in the future, as he builds his presence in this market). Has decided on a niche market for his practice (working with employees of the nation’s largest employer). Worked with an organization to host the program and invite their members, (in this case, the WFEA) rather than blindly sending mass mailings. Didn’t need to buy anyone dinner at a nice restaurant to motivate them to attend (we provided communications materials to the organization’s members to explain the benefits of attending). Contracted with a firm that has developed and successfully presented these types of programs regularly, and specifically for his market (my company). Wasn’t afraid to bring in an outside expert to professionally present the information (I believe that was me). Provided useful, relevant, and objective information which was designed to really help the attendees, rather than to mislead or scare them. Offered to follow up with only those who actually requested his help. As a result of his efforts, it wasn’t necessary for this adviser to spend thousands of dollars on mass mailing of invitations. In fact, he may actually RECEIVE invitations to present similar programs from the Federal agencies whose employees couldn’t attend (after hearing about the program from their colleagues). This case study is an excellent example of a successful niche marketing program. Do you want to attract someone to your seminar? First, decide exactly who you want to attend. Then, develop a program that is unique and targeted to that particular audience. And, enlist the help of an interested organization who may also benefit by helping you to sponsor or host the program. Maybe it’s time to finally stop those boring, cookie-cutter financial planning dinners and try something new. Sorry, Maggiano’s.